NMT Crane Hire have a wide range of mobile telescopic cranes available to hire, ranging from a very compact 10 ton Kato City crane to an equally compact Terex Demag 400 ton crane. Our fleet of modern all-terrain cranes are operated by fully-trained personnel to CPCS standards and are serviced in our own workshops by our own fitters. We can offer our cranes including Mobile Tower Cranes nationally throughout the UK as well as locally in Bedford, Milton Keynes and Buckinghamshire. We have city cranes from 10 to 70 tons, ideal for working in very confined areas. These can manoeuvre within towns as well as cities and are very quick to rig and de-rig. All terrain cranes from 25 to 80 tons, including the Terex Demag 35 ton cranes with a long 37m telescopic boom and the Terex Demag AC55 ton crane with a 44m telescopic boom. 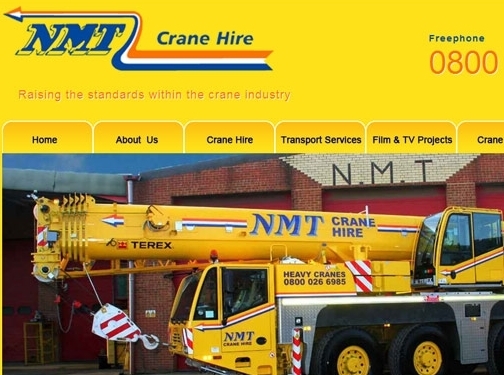 UK-based crane hire and sales company - been in operation for 30 years. Company address found sitewide at footer of page. Large free phone number at top. Page dedicated to crane sales. News section updated about once a month.